Stir the butter, sugar, orange peel, cinnamon, stuffing and pecans in a medium bowl and set aside. Stir the cranberry sauce, orange juice and apples in a large bowl. Add half of the stuffing mixture and stir lightly to coat. 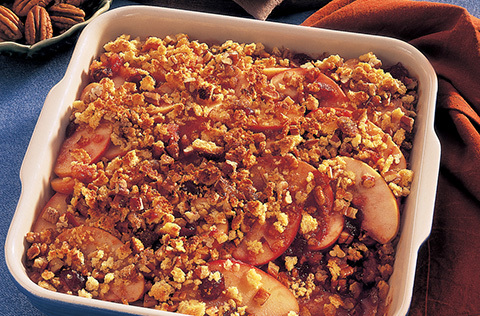 Spoon the apple mixture into an 8-inch square baking dish. Sprinkle the remaining stuffing mixture evenly over the apple mixture. Bake at 375°F. for 40 minutes or until the apples are tender.